The apartment Wirksworth offers luxury contemporary accommodation in the heart of the town. Adjoining George House, a grade 2 listed property, the apartment was part of the ten year resoration project. It offers high quality facilities with an emphasis on an easy lifestyle. The private garden is an ideal place for a summers evening and in the winter, the warm environment of the apartment is a real sanctuary. The living accomodation is light and airy and is equipped with all essential requirements. The apartment can be booked for shorter periods, please contact us. The Apartment Wirksworth and George House were renovated by Val and Lester. The main property dates back to Georgian times and was originally built as a coaching inn. The apartment and garden were a special aspect of the refurbishment bringing contemporary design to this historic site. For four years the apartment was home to Val and Lester during the renovation of the main house and the comfort and pleasure derived from this experience made them realise that others too, may enjoy this sanctuary in a beautiful Derbyshire landscape. Val, an artist and Lester a musician have lived in Wirksworth for twelve years and engage with the many creative opportunities which are on offer within the community, and the annual Festival in September brings thousands of visitors to the town. The apartment is an ideal place to relax, or to visit the amazing, historical sites of Derbyshire. The apartment is situated on the edge of the town within walking distance [ 2 minutes] of the centre. 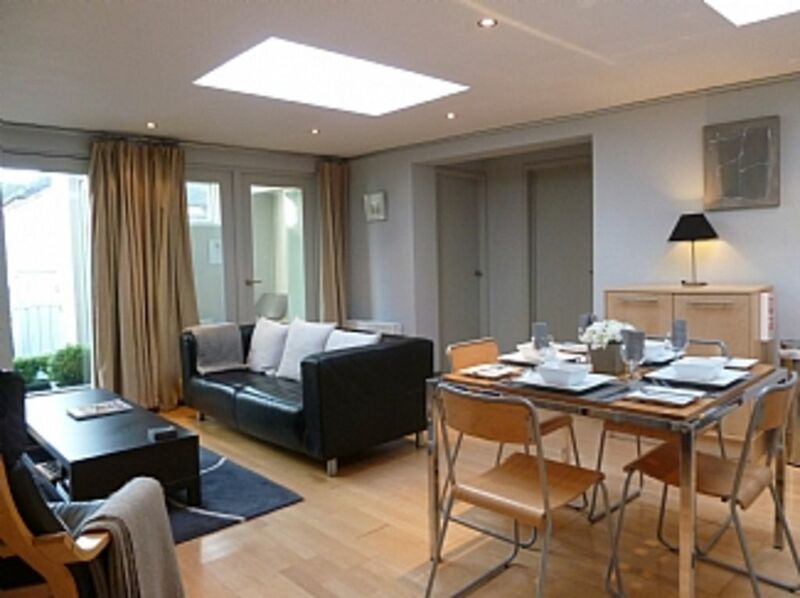 Ideal for two people, 4 friends or a small family the apartment provides a comfortable contemporary living space . The open plan living area has a 3 seater sofa and chair, coffee table with a selection of books, CD's, DVD's and games. TV, with DVD and radio. Free WIFI access. The french windows open to the patio and garden area. Notes on accommodation: The apartment is non smoking Outside: The apartment is located in the garden of George House which has table, chairs umbrellas and sun loungers. Limited Parking is available in the grounds Utility Room: Entrance lobby has storage and shoe rack Cleaning / Towels / Linen / Maid service: Fresh linen and towels are provided, and the apartment is thoroughly cleaned between guests Other: The combination gas boiler provides constant hot water and heating. We fell in love with both the inside and outside space - making the apartment the perfect base - and making us a bit reluctant to leave at all! Val gave us a lovely welcome and couldn't have been kinder. Wirksworth is lovely and vibrant and a great base to explore the beautiful Peak District. Had a great time away with the family and the apartment was excellent. The kids loved the games and we were made really welcome by Val. We’d certainly stay there again and can highly recommend. We had a fantastic stay at the appartment which was perfect for our family. Everything we needed was there and the location was great with a shop and pubs just a few steps away. Alton Towers was about 30 minutes away, we also visited Crich Tram Museum, Poole Cavern, the Peak Wildlife Park and Monkey Forest all within easy reach. good well furnished apartment in an interesting village. Owners were very friendly and helpful. We were cycling and there are certainly plenty of good hills if you want a bit of a challenge. We stayed in Wirksworth as we wanted access to the Tissington Trails and though a bit steep we could walk up to Middleton Top to hire bikes in about 30 minutes. This enabling us to have a drink half way at the Royal Oak in Hurdlow, highly recommend best meal we had in the Peaks, a few beers and not have to worry about driving back to our apartment where we could recover from the day. The apartment was perfect everything you need, bright and fresh, while very comfortable and clean. Val was lovely and on hand for any queries and a smile. There is parking and your own garden if the weather is warm enough to enjoy. We ate one night at Le Mistral in Wirksworth which is well worth a visit had a really nice Seabass and my husband a spicy chicken dish, the pubs unfortunately are not great though the Red Lion is more welcoming inside than it looks from outside and very reasonable for a drink. But we found plenty of lovely pubs on our walks. As already mention the Royal Oak at Hurdlow our favourite, Knockerdown Inn which is only about a 10 minute walk from Carsington Reservoir had a really lovely lunch there a nice beer garden though it is next to a fairly busy road, also Carsington Reservoir is a great place to walk round. we did walk there from Wirksworth but its quite a difficult walk to follow as the farmer has blocked a path. We had another great meal at The Bowling Green in Ashbourne, which is a really nice town, my husband who rarely eats steak in England said it was really good and the staff were lovely, we also visited for a drink the George and Dragon in Ashbourne very nice.. On our last day we walked to Matlock as wanted to walk along the Derwent and the Canal at Cromford a lovely walk, though walking through Matlock Bath is not so great, but following the river through to Matlock is though a very steep walk you get some great views your even above the cable car. Pubs are not great in Matlock we had to walk slightly out and found a great pub with a garden the Red Lion at Matlock Green and met some very friendly locals. All in all we had a great time, would highly recommend the area and the accommodation. East Midlands Airport 45 minutes/25 miles. Birmingham Airport 1 hour 15 minutes/50 miles. Manchester Airport 1 hour 30 minutes/ 60 miles. There is a local train service to Cromford [apx 2 miles away] and we can collect guests from this station. Ashbourne 20 minutes / 10 miles. Wirksworth is an historic market town which is an ideal base for a holiday. The lcoal countryside offers beuatiful walks along with other activities such as Carsington Reservoir for sailing and The High Peak Trail for cyclists. Guests can join the local gym facilities for the duration of their stay. The town has 3 convenience shops, 2 bakeries, 2 butchers, a pharmacy, a dentist, healthcare centre, a post office, banks, restaurants, take-a-ways, cafes, public houses and childrens parks. Booking Notes: We will email you a form to confirm the details of your visit. We request a £75 deposit. The full balance payment is requested 4 weeks prior to your stay. We accept cheques and balance transfers. Changeover Day: Please contact owner. Notes on prices: The apartment can be bookeed for shorter periods, please contact the owner for details.